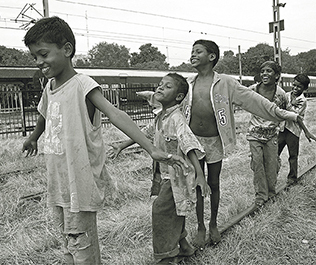 Twenty-nine years ago, we discovered the world of street children within the harsh, raw, underbelly of Delhi. And yet, it was a life these children had chosen in preference to home and family - which had obviously become entirely intolerable. There is so much missing from the lives of these children - food, security, health, education and love. All these, we urged ourselves, they needed and had a right to - a secure space to sleep, to play, and to dream. This realisation paved the way for creation of Salaam Baalak Trust (SBT). Salaam Baalak Trust is an Indian non-profit and non-governmental organisation registered as a Trust to under the Indian Trust Act (1908) provide care and protection support to street and working children in Delhi and NCR. The Trust was established in December, 1988 with the proceeds from the film Salaam Bombay - a film depicting the lives and vulnerabilities of street children directed by Mira Nair. The name Salaam Baalak Trust translates literally to a Trust which 'salutes the child'. Saluting the indomitable spirit of street children without distinction of gender, religion or caste lies at the heart of our work. Girls and boys, under the age of 18 years, living and working on streets are welcomed at our centres. We 'salute' their resolve to live a life of dignity and by providing them with care, love, along with health, nutrition, education and vocational training facilities to fulfil their dreams. In 2011 Salaam Baalak Trust was honoured with National Award for Child Welfare 2011.